If asked to identify which children rank lowest in relation to national educational norms, have higher school dropout and absence rates, and more commonly experience learning problems, few of us would know the answer: white, urban Appalachian children. These are the children and grandchildren of Appalachian families who migrated to northern cities in the 1950s to look for work. They make up this largely “invisible” urban group, a minority that represents a significant portion of the urban poor. 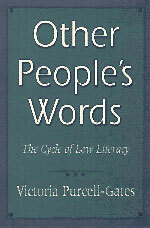 Literacy researchers have rarely studied urban Appalachians, yet, as Victoria Purcell-Gates demonstrates in Other People’s Words, their often severe literacy problems provide a unique perspective on literacy and the relationship between print and culture. A compelling case study details the author’s work with one such family. The parents, who attended school off and on through the seventh grade, are unable to use public transportation, shop easily, or understand the homework their elementary-school-age son brings home because neither of them can read. But the family is not so much illiterate as low literate—the world they inhabit is an oral one, their heritage one where print had no inherent use and no inherent meaning. They have as much to learn about the culture of literacy as about written language itself. Purcell-Gates shows how access to literacy has been blocked by a confluence of factors: negative cultural stereotypes, cultural and linguistic elitism, and pedagogical obtuseness. She calls for the recruitment and training of “proactive” teachers who can assess and encourage children’s progress and outlines specific intervention strategies.